When I first got here, the weavers asked me in what way had I been sick that I’d had to postpone my trip to Nicaragua for almost a month. I told them I’d had a mastectomy on July 6th so I had wait until August 3rd to come to Nicaragua (God bless mammograms!) But I was okay now, they got it all, nothing to worry about. The next day Ana brought a hammock she’d borrowed. It’s one of those beautiful striped ones from Masaya with the crocheted shells draping along both sides. The weavers would brook no nonsense: I was to take a nap every day after lunch whether I wanted to or not. So I did, and it was a real comfort the first week, I’ll admit. Ana Maria took the hammock home with her for Sunday and had it hung kitty-cornered across her living room for me. “Not outside in the breeze?” I asked. “No, Elenita, the birds will caga on you.” So she turned on her new TV and I was supposed to watch it, I guess, but I slept all afternoon. We’re dyeing up yarn to make some baby blankets. I think it’s a wonderful idea. We had a request for some that were “non-gender specific” as to color. So I get to put my ideas into play – modified, of course, by what one can reasonably expect the weavers to do for a price. We’re getting some nice colors. Mirian’s kids have a pet pink-eyed white rabbit, four months old. It has the run of the house and the patio, and they sit with it in their laps at night while they watch TV just as they do with the kitten. The kitten is almost the same age as the rabbit and they play together. It’s fun to watch. Sometimes the rabbit gets bold and goes out the front door and into the street. He’s usually back in a hurry, making six-foot leaps ahead of some dog. He may not be fast enough one day. Last year Hector, who is 19 now, showed me some reading matter about an organization for women’s rights that he has joined. This year there is a laminated-in-plastic certificate on the living room wall that says Hector has completed a course in “reproduction health” and “planned parenthood”. It took me almost a week to get up the nerve to congratulate him and to ask him if he was practicing what he’d learned. He laughed and said he was. Good for him. I think Mirian is raising some sensible kids. The next weekend Cecilio’s dad wanted to borrow the clippers. Cecilio said they gave 15 haircuts. I’m almost afraid to walk through that neighborhood for fear it will look like a bunch of skinheads. This is not a fashion I cherish, but I’ve ended up giving several of those cuts myself. Then one day Ana asked me to cut her hair. Sure. So I got out the scissors and started cutting. “No, Elenita. La maquina,” she said, she wanted me to use the clippers. “Like Cecilio’s?” I asked, disbelieving. “No, como hongo.” (Like a mushroom.) I wouldn’t do it because I had no idea how to start, but Cecilio did it. Ana said she liked it. Trimmed close to the top of the ears and cut longer on top, like a mushroom. The next day the woman next door came for a hongo. Her hair isn’t so curly so it looks pretty good. Yes, I did this one. Then her brother came for a haircut. Three or four days later they asked me if I’d give their mother a haircut. Why not? So she came, her long hair worn in a bun on the back of her neck. “You want an hongo cut?” I asked, kidding. No, she just wanted it cut – it hadn’t been cut for 20 years. What the heck. I chopped it off just below her ears, trimmed it up, and she said her head felt as if it was going to float away with all that weight of hair gone. You know what’s really funny? No one, including me, has a mirror so these haircuts are sort of given blind. They don’t know what’s happening. It scares me pea green but it doesn’t seem to bother them. 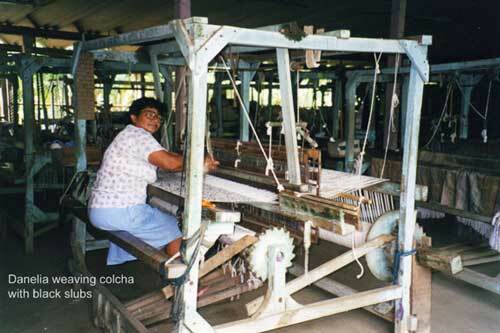 Ana Maria accepted a commission for an 80 inch wide colcha in the madreselva (honeysuckle) design Mirna weaves so much. So today they moved that big loom out of the dark corner, cleaned it up and started painting it white. It had never been painted and was so dark it was hard to see to weave on. Most of the weavers can’t manage the big loom. So far as I know, only Rosa Maria can, and weaving it in a pattern is going to be tough. There are no lamms on the loom and I refused to put any on it. I want them to go with a direct tie-up and learn to weave with both feet. The weight of two of those long harnesses at a time would be a leg-killer; better the weight be divided for both legs. They’ll learn, I hope. My friend Pam Whitehead donated three big boxes of cotton yarns she decided she wasn’t going to use soon. She sent them to New Haven to come down on the September container, but they looked so good that Alan brought down as much as he could get into a suitcase. Some of it was a lovely white which we proceeded to dye and it’s all woven up. When It came off the loom, it was gorgeous. Stunning. Elegant, even. To me. They still doubted. Three days later a group of Americans came to buy. The black and white with the big slubs was the first throw selected, and the woman who chose it wouldn’t put it down for fear someone else would grab it, since there was only one. The weavers all laughed when the Americans were gone. Elenita was right again. These Americans and their funny tastes. I wish we had 200 pounds of that yarn. Every neighborhood here has its little pulperias, little mom-and-pop stored that sell assorted things. Also little farmacias where you can buy Pepto Bismol if you need it, or one foil-wrapped Alka Seltzer tablet, or Panadol. Why buy a whole package if you only need one or two? There are also houses that sell prepared food. Sometimes they put up a little table along the edge of the street or on a sidewalk. You can buy a cup or a large bowl of cooked beans, slices of watermelon, salty roasted ears of corn. Sometimes they have condiments and you can get a spoonful of mustard if you want it, or maybe a relish. Few people have refrigerators and if they do they sell bags of ice. Not the bags of ice cubes you are accustomed to, but quart or half-gallon size bags filled with water and frozen – and what a God-send that is! The pulperias serve a real need here. You can buy one sewing needle, or one button if they have the color you want, 1/4 or ½ cup of oil if you bring your own container. Vick cough drops sold in foils of 5 (not Vick’s – they don’t use the possessive in Spanish). I’ve seen Ana buy one egg, and Jennifer buy four slices of white bread, not a loaf. It eliminates the need for storage cupboards and refrigerators. It makes real sense for this country, these people. It would be tough for me because I was brought up with the putting things by” tradition of filling your shelves so you didn’t go hungry later, to always have a back-up needle or thread or whatever in case I’d need it. Besides, I’m a pack-rat by nature. Mirian and Danelia are both raising a pig in their back yards. I wondered how they handled the meat, so I told them when I raised pigs, I had them butchered and the meat packaged and frozen to eat a little at a time. What did they do with their meat? Tortillas here are not like the “Mexican” tortillas we have in the states. I’ve never been to Mexico so I don’t know what they are like there. Here, tortillas are made by women in the neighborhoods who buy the masa dough from a supplier and carry it home in a plastic dishpan on their heads. The tortillas are patted to shape by hand and are thicker and lumpier than “our” tortillas and are all made from white corn. At mealtime, someone goes to the tortilla-maker and comes back with a plate of hot tortillas. They don’t taste the same in every neighborhood, so the dough probably comes from different suppliers. I like some better than others. Guacamole here is different: chopped avocado with chopped hard-cooked egg and chopped onions, mixed together and laced with lime juice.